Introduction: I introduced myself to the newcomers, and we went over our storytime rule about not going in front of the storytime carpet. The Tuesday group was good about following this rule. The Wednesday group…not so much. Opening Song: Open Shut Them. The children who didn’t know the song last week, followed along quite well this week. They learn so quick. 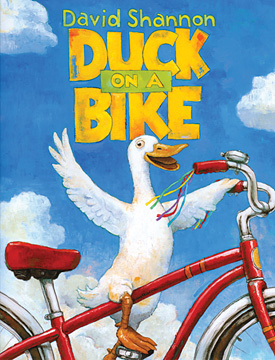 This is a fun book about a duck who rides a bike one day. The kids liked the various animal sounds in it, and it has a two page, wordless spread that shows all the farm animals looking at a group of bikes — perfect for asking the crowd what they think will happen next! Okay, I know I stole this from someone, but I can’t remember who! It was before Flannel Friday really kicked off, so I wasn’t saving many flannelboard ideas and writing down who to credit. My apologies! 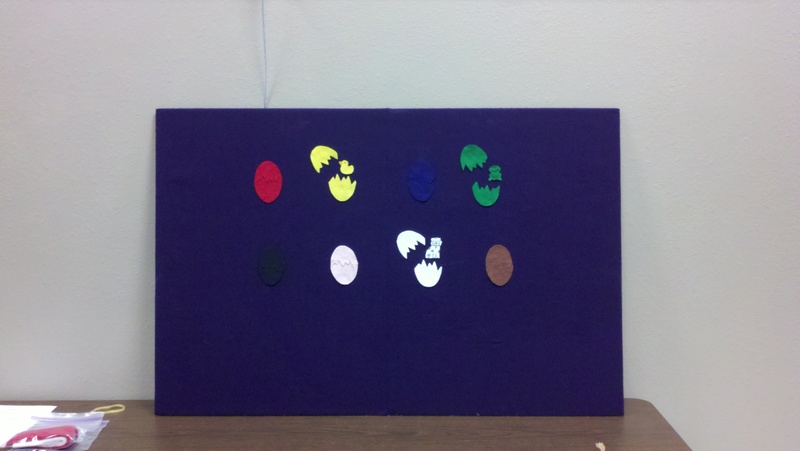 You guys know the drill with this one: hide a baby duck (and other various animals) behind different colored felt eggs. Then have the children say, “Baby duck, baby duck, are you behind the ____(red)____ egg?” My Tuesday group guessed it correctly on the second try, so I had them close their eyes as we sang a song and I moved baby duck to another egg so that we could continue the game. In this story, Mr. Rabbit is neat and tidy and likes things just so. 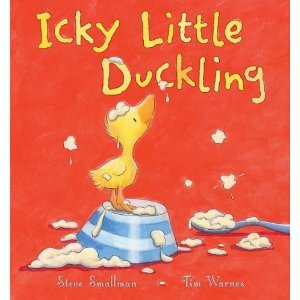 But when he finds an icky little duckling, his life gets a little bit messy. 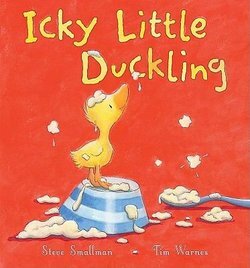 This was a very cute story and the kids figured out that it was a duckling in the egg long before Mr. Rabbit did (seeing as our theme was ducks, and seeing as I did tell them the title of the book first, I guess they had a few big clues). 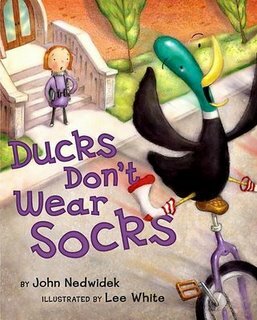 This book is about a serious little girl who meets a silly duck who wears a different item of clothing each day. My Tuesday kids loved guessing which item of clothing the duck would appear in next, and they giggled when he showed up wearing underpants. We skipped this book on Wednesday though. 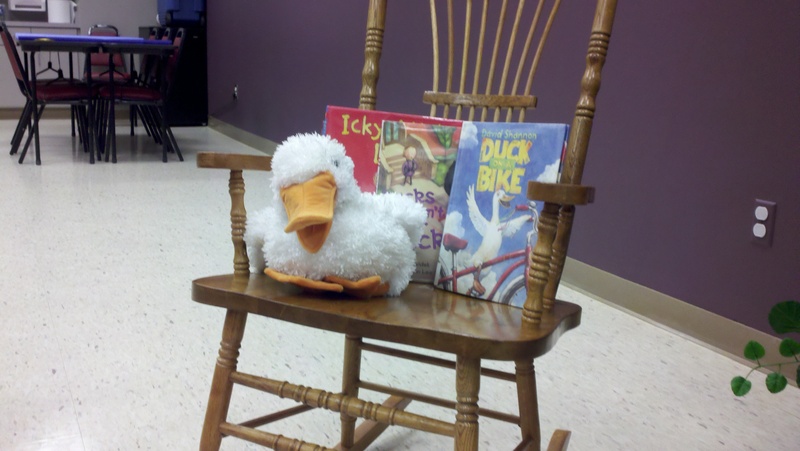 The kids were restless by book 2, so we just did the Duck Starts with D activity then called it a day. Sometimes you just have to cut storytime short. 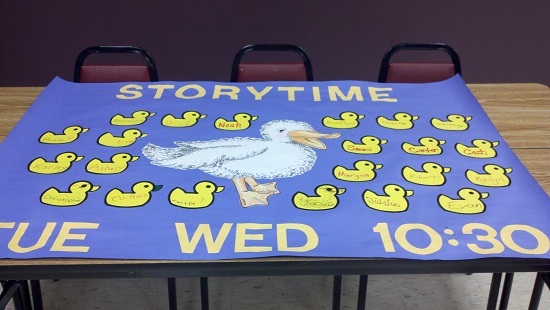 I had made a storytime poster to hang out in the youth department. I’ve found that we get a lot of new parents in the youth department, but they don’t always look at our website, or pick up one of our calendars or other promotional handouts, so a gigantic poster is something that catches their attention. A very talented library assistant drew Quacky for me, and I printed out duck clip art on yellow cardstock for the children to write their names on. AMAZING storytime poster! I am drooling over here.